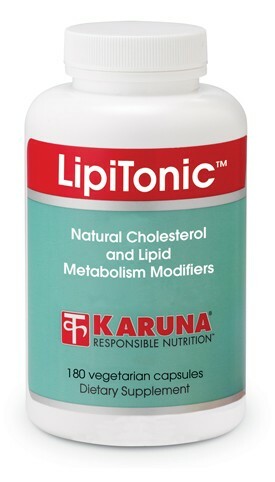 LipiTonic combines a comprehensive formula of vitamins, minerals and botanicals that specifically support normal lipid metabolism. Multiple interrelated mechanisms are targeted, including cholesterol synthesis, pathways of hepatic lipoprotein production, insulin function, and antioxidant protection. The B-complex vitamin niacin is present primarily as inositol hexaniacinate to reduce likelihood of flushing. Combined with a healthy diet and regular exercise, Lipitonic represents a safe, natural approach to maintaining normal blood lipid levels. Chinese red yeast rice extract contains compounds which modify cholesterol metabolism and may promote cardiovascular health according to numerous clinical studies (J Fam Pract 2003;52:468-78; Evid Based Complement Alternat Med 2012;2012:636547). Supplementary inositol hexaniacinate supports normal cholesterol and triglycerides levels (Artery 1980;8(2): 113-9) and inhibits release of adipose fatty acids during sleep (Eur J Clin Pharmacol 1979;16:11-15). Pantethine, a natural derivative of coenzyme A, has a favorable effect on blood lipids demonstrated in many studies (Atherosclerosis 1984;50:73-83; Angiology 1987;38:241-7). Chromium supplementation, probably through effects on insulin function, often helps influence the production and metabolism of LDL and HDL cholesterol, as well as triglycerides (Diabetes Technol Ther 2006;8:677-87). Supplementation with CoQ-10 is recommended, as red yeast rice components may lower tissue levels of CoQ10. Vitamin E supplementation may support optimal protective high-density lipoprotein (HDL) cholesterol level in some individuals (Isr J Med Sci 1987;23:869-72), and reduce the susceptibility of low-density lipoprotein (LDL) cholesterol to oxidation (Arterioscler Thromb 1993;13:1779-89). Suggested use for adults: Six capsules daily in divided doses, or as directed. 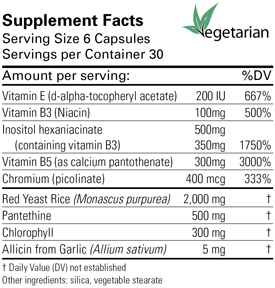 Supplementation of CoQ-10 is recommended, as red yeast rice components may lower tissue levels of CoQ-10.